This article is about the item from the Super Smash Bros. series. For the souvenirs from WarioWare: Twisted!, see Fan (souvenirs). For the item from Mario's Time Machine, see Fan (Mario's Time Machine). For the Thing from Paper Mario: Sticker Star and Paper Mario: Color Splash, see Sticker (Paper Mario: Sticker Star) § Fan and Battle Card (Paper Mario: Color Splash) § Fan. 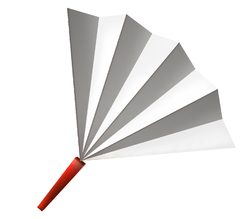 Artwork of the Fan from Super Smash Bros.
A Fan or Paper Fan is a weak item in the Super Smash Bros. series, found in the first three games. Much like the more powerful Beam Sword, it would replace many of the player's normal attack moves with quick fan swipes if picked up. Although it does very little damage, its attacks are quick and a smash attack will almost completely destroy a player's shield. If hit by a thrown fan, the player will fly straight up in the air, setting them up for other attacks. 4/99 The Fan can be swung so rapidly that it leaves opponents unable to counterattack. It is, however, an exceedingly weak weapon. Despite this shortcoming, the Fan is quite effective as a shield breaker, and it works well at disrupting an enemy's equilibrium. Throw the fan to send your foe bouncing straight up into the sky. N64 Super Smash Bros. An item made by taking thick paper, folding it accordion-style, taping one end, and fanning out the other. It's mainly used as a comedic prop by comedians from Osaka and the Kansai region of Japan. Why it's in Smash Bros. is a mystery. Grab this unique item and whack foes to turn them in the opposite direction. Throw a fan at a foe, and that character will fly straight up. This page was last edited on March 1, 2019, at 00:50.